Thanks to Tony Muhitch for sharing this story about his quest to validate his memory of a soccer riot that occurred in Fred Hamilton Park over 50 years ago! One late summer afternoon many bodies had suddenly come flying through the Roxton/Ossington lane, over and between garages, into backyards, into the Lumsdens’ stairwell next door and into the Jimotellos’ stairwell. Men hid everywhere. I distinctly remember men trying to hide from police even in basements. But did the Fred Hamilton Park soccer riot actually happen? When I first confidently googled this event, little did I know it would take more than a year of sleuthing to find the truth. In the beginning, over a year ago, the search engine failed. Like the martian war machines in the War of the Worlds melting in the rain, Google failed momentously. No combination of words or phrases found any “Fred Hamilton Soccer Riots.” What could I say to the neighbourhood newsletter editor? My sole guiding star for over a year of searching would be a stubborn memory that the riot happened in the ‘50s. Later I learned that the date was August 23, 1959. My ‘aha’ moment would be the word ‘microfiche,’ an ancient technology also from the ‘50s. I thought that I would go down to the Toronto Star headquarters and research their microfiche files, but not before wasting even more time and energy on Google, like a long goalless draw in soccer. In the next year, in between retiring and dealing with ongoing body repairs, I never made it to the Toronto Star building anchored right at the lake. We fast-forward to this March, in fact the Ides of March. I am in the Toronto Public Reference Library, and for some unknown reason, while filling out information for a free library card, I surreptitiously ask the librarian if there are any newspaper records in the building. When I hear ‘Yes,’ I feel like Brutus, ready for history. I slap-run in my sandals to a computer and frantically type in `Fred Hamilton soccer riots` into the Toronto Star program. Twenty minutes later, my latest and greatest search result is 239. But there is still no story remotely related to the Fred Hamilton soccer riots. Then the gods smile on me, and I search sporadically by date, looking for entries from the ‘50s. Not without trepidation, five minutes later I find my first authentic reference to the riots in the Sept. 23, 1959 edition of the Star. Next, I find a Sept. 17 story and then the original report of Aug. 23, 1959. The soccer field at Fred Hamilton Park had been the size of an Olympic hockey rink. That there were reported crowds of 5,000 owes more to the imagination of sports reporters than to fact. 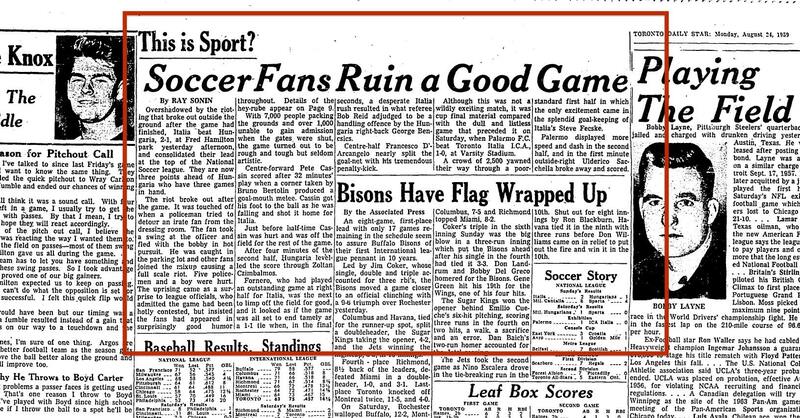 The Toronto Star reports that the game that day had been between Toronto Italia and Toronto Hungaria. And Toronto’s finest were indeed called to impose peace: too much competition and too little space had become a volatile mix. Sadly, the stories in the Star were marked by racist bombast. Soon after the riot, just like the demolition of the Dufferin Race track in 1955, the soccer stadium was taken out of the neighbourhood. The city had outgrown another hobbit warren. Toronto was no longer an outsized small town. Now, sometimes on early evening autumn days, when I remember delivering newspapers on Montrose and Beatrice and Shaw, I hear the faint sounds a public address system. By Tony Muhitch, lifelong neighbourhood resident. Great story Tony. I remember that Fred Hamilton was at least a partially covered stadium and I did see a couple of games there. Do you happen to remember the controversy regarding Jimmy the blind news agent stationed in front of Federal Grocery? I have not been able to find anything about that! I tried messaging you on Facebook, I also have a Facebook account if you want to contact me.